Have you ever had an itch - and not scratched it? In the Buddhist tradition, this points to a vast paradox: that by refraining from our urge to "scratch," great peace and happiness is available. 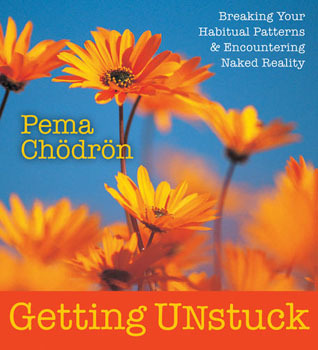 On Getting Unstuck, Pema Ch÷dr÷n introduces a rare Tibetan teaching she received from her teacher, Dzigar Kontrul Rinpoche, and one that has become critical to her practice. Here, she unveils the mystery of an ineffable quality; a "pre-emotional" feeling that arises in us, brings us discomfort, and causes us to react by escaping the discomfort - often with harmful habits. With Getting Unstuck, she offers us a first look at "both the itch and the scratch": what Tibetan Buddhists call "shenpa." Recognition, Refrain, Relaxing, and Resolve: the four Rs of working with shenpa, and more.